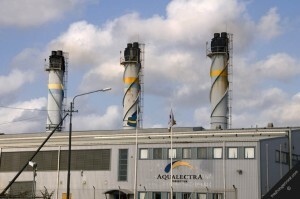 WILLEMSTAD – Utility Company Aqualectra will very likely take over the Reverse Osmosis (RO) units at Mundu Nobo from General Electric, when the contract expires in 2017. This is according to the utility company’s director, Darick Jonis. Last October, the new production unit of General Electric was taken into operation to supplement the water production of the company. The production unit has a capacity of 8,000 cubic meters. Based on a build-own-operate-transfer contract GE manages the Reverse Osmosis unit at Mundo Nobo. General Electric is therefore the owner of the water production unit there. They perform the work with their staff. When the contract expires Aqualectra plans to take over the new unit. GE also operates a water production unit from 1995. This unit has been overhauled and improved not so long ago. Aqualectra will not take over this unit when the contract expires. Aqualectra already has its own plant at Fuik for the production of water.